Attend this session to lecture by Becky Farley, PhD, to learn how targeted exercises that are both physically and cognitively challenging can also trigger physiological mechanisms that may slow down disease progression. This year Parkinson’s UK are the official partner for the UK’s biggest ultramarathon. This is a great opportunity for campaigners to walk, jog or run the epic 100km to the historic Avebury Stone Circle. Get down to Signature Lanes in Elkhart, Indiana for the second annual ‘Party to fight Parkinson’s’ event. This family-friendly occasion will include a bowling tournament, food, a raffle and a silent auction. Pedal through the forests, farmland and winding river valleys of the greater Cuyahoga County. Participants can choose from courses that range between 10–75 miles. All proceeds go to the Michael J Fox Foundation. Take part in a one-mile, three-mile or five-mile sponsored walk in Greenwich Park, home to the world famous Meridian Line and Royal Observatory. There will also be demonstrations from Parkinson’s exercise equipment companies. The Leicestershire, Northamptonshire and Rutland Committee invite guests to an evening of fine wines, fun and fibs. An expert panel, led by wine expert Hugh Johnson, will join the audience in tasting a selection of wines. All proceeds go to The Cure Parkinson’s Trust. This annual event aims to raise awareness and promote advocacy relating to brain health. This year’s theme is “our brain, our future”. Spend six days and five nights at the Hockley Valley resort, learning the skills you need to live well with Parkinson’s, from both experts and your peers. Why not take part in Tough Mudder, a 12-mile obstacle course designed to test stamina, strength, teamwork and mental grit. If you sign up with Parkinson’s UK you’ll receive help both throughout your training and on the day. The challenge runs until September. 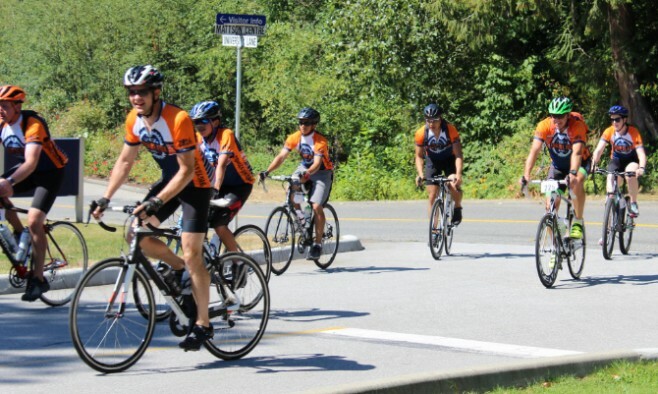 The Cure Parkinson’s Trust will be fielding a team at this 46-mile cycling event. The route stretches between the Queen Elizabeth Olympic Park and Pall Mall. Members of the team will receive fundraising materials, a breathable cycling jersey and ongoing support.